RORATE CÆLI: Special Series: "1919—2019 A Centenary Meditation on the Church" - Part IV: “Catholic” Purification and "Worker-Priests"
Special Series: "1919—2019 A Centenary Meditation on the Church"
- Part IV: “Catholic” Purification and "Worker-Priests"
IV. "Catholic" Purification and the "Worker-Priests"
Many personalists looked, greeted the early fascist victories of the Second World War hopefully. A number of them, long convinced of the innate weaknesses of the liberal bourgeois “established disorder,” expressed little surprise over the conquests of Nazi Germany. What really concerned them was whether Catholicism could find some way to turn a potentially apocalyptic “purification” down the proper pathway. For fascism was seen to be a “monstrous prefiguration” of the new personalist humanity waiting to be born. It clearly revealed the presence of strong will, virile manliness, self-sacrifice to the community, and even, in the context of the war effort, a commitment to the construction of that European-wide super society which many thought to be crucial to a better New World Order. Pétain’s so-called National Revolution was appreciated by French personalists both because of its anti-liberal bourgeois character and its freedom from the more gross “materialist” aspects of Nazism. They hoped to make Vichy France a wartime laboratory for educational and evangelical schemes designed to reshape the world in a spiritual way. One major example of educational experimentation incorporating both contemporary Catholic ideas as well as features of the fascist Ordensburgen—the castle training centers for the new elite of German youth—was the École Nationale des Cadres at the Château Bayard above the village of Uriage, near Grenôble. Founded in the waning months of 1940, this institution became especially significant by June of 1941, when the Vichy regime determined to require a session at the Ecole for all future high government functionaries. The teachings of a vast array of Catholic luminaries and their fellow travelers were marshaled under the banner of the National Revolution to play a role at Uriage. Still, under the day-to-day direction of Pierre Dunoyer de Segonzac (1906-1968) and the guidance of the Study Bureau of Hubert Beuve-Mery (1902-1989), Mounier’s “communitarian personalism” was central therein. This was true even after political problems led to Mounier’s removal from its staff. For his vision continued to prosper through the similar teaching of his friend, Jean Lacroix (1900-1986), and their common master, Jacques Chevalier (1882-1962), professor at Grenôble and sometime Vichy Minister of Education. Allied with personalism at Uriage was the radicalizing influence of the budding New Theology. This arrived via the Dominican houses of Saulchoir and Latour-Maubourg, the Jesuit center at Fourvières, the journals La vie intellectuelle, Sept and Temps present, the French scouting movement, and specialized Catholic Action groups stimulated through the activity of Joseph Cardijn with young Christian workers in Belgium. Segonzac and Beuve-Mery had frequented such circles before the war. They happily brought to Uriage priests like Henri de Lubac (1896-1991), Jean Maydieu (1900-1955), Victor Dillard (1897-1945), and Paul Donceour (1880-1961). These men, in turn, introduced students to the writings of Lamennais, Henri Bergson (1859-1941), Maurice Blondel (1861-1949), Charles Péguy (1873-1914), Marie-Domenique Chenu (1895-1990), Yves Congar (1904-1995), Karl Adam (1876-1966), Romano Guardini (1885-1968), Charles de Foucauld and, perhaps more importantly than anyone else, Pierre Teilhard de Chardin (1881-1955). Uriage also had links, direct and indirect, with Frs. Louis Joseph Lebret (1897-1966) and Jacques Loew (1908-1999), founders of the Catholic social movement, Economie et Humanisme, which was destined for a significant “progressive” future in Latin America as well as in Europe. Students at the École were thus familiarized with currents of biblical, historical, spiritual, liturgical and philosophical thought that, while marginal at the moment, would become immensely powerful and instrumental in guiding the Second Vatican Council and the post-conciliar Church. And this team, “ensconced in a chateau up in the mountains with a commission to completely rethink and transform the way France educated its young people”, was absolutely and enthusiastically convinced that it was the prophetic guide to the future. Surely development is slow and long when only average men are working at it. But then heroes, geniuses, a saint come along: a Saint Paul, a Joan of Arc, a Catherine of Siena, a Saint Bernard, or a Lenin, a Hitler and a Mussolini, or a Gandhi, and suddenly everything picks up speed...[H]uman irrationality, the human will, or simply, for the Christian, the Holy Spirit suddenly provides elements which men lacking imagination would never have foreseen. May the democrat, may the communist, may the fascist push the positive aspirations which inspire their enthusiasm to the limit and plenitude. As John Hellman explains, “Mounier’s belief that there was an element of truth in all strong beliefs coincided with Teilhard’s vision of the inevitable spiritualization of humanity”. This belief, Uriage as a whole made its own. Let it be emphasized once more that the message taught at Uriage was not a rational one. Its ultimate justification was the prophetic intuition of teachers giving witness to the coming New Order and their strength of will in leading men to creative action. Any appeal to logic, either in support or criticism of strongly willed commitment to the natural values they approved was dismissed as either belaboring the given or as dangerous, decadent, crippling, individualist scholastic pedantry. Better to bury the temptations of a sickly rationalism through the development of the obvious virtue of “manliness”—a virtue defined in completely anti-intellectual ways: the ability to leap onto a moving streetcar; to ride a bicycle up the steep hill to the École like Jacques Chevalier; to look others “straight in the eye” and “shake hands firmly”; to endure the sweat-filled regimen labeled décrassage devised for students under the inspiration of General Georges Hébert; to sing enthusiastically around the evening fire in the Great Hall; to know how to “take a woman”; and, always, to feel pride in “work well done.” Such manliness was said to have deep spiritual meaning in and of itself, aspects of which were elaborated in lectures like de Lubac’s Ordre viril, ordre chrétien (Virile Order, Christian Order), and Chenu’s book, Pour être heureux, travaillons ensemble (For Happiness, Let Us Work Together). Finally, let us stress that Uriage’s teaching was unabashedly elitist. In fact, the particular mystique of the École was that of developing the natural value of leadership. “The select youth of Uriage” were said to be “the first cell of a new world introduced into a worn-out one”, “entrusted with the mission of bringing together the elite from all of the groups that ought to participate in the common task of reconstruction in the same spirit of collaboration”. Since they were destined to reveal the eternal supernatural significance of the natural values witnessed to by the mystique of all virile communities, Uriage students were in some sense priestly figures as well. Each class was consecrated and given a great man’s name as talisman. Segonzac especially “took upon himself a certain sacerdotal role, even regarding the wives and children of his instructors”. This entailed also a “separation between the leaders, the lesser leaders, the lesser-lesser leaders, the almost leaders and the not-at-all leaders” irritating to some of the interns. “The central team,” as one of them indicated, “were gods”. Nevertheless, for those manly spirits ready to leap off of streetcars moving towards indeterminate destinations, sit down in a café, and indulge in a little logical scholastic debate, the education imparted at Uriage might easily seem to be sacrificing the corrective and transforming mission of Catholicism at the altar of fascism rather than taming the “monstrous prefiguration of the future” that it represented. But, then again, the reader is all too familiar with such spiritually disguised labors on behalf of the Coalition of the Status Quo. He knows that this particular manifestation of an age-old phenomenon emerged out of the same concern to restore a shattered western social order by appeal to the non-rational will of virile communities stirred to action by charismatic prophets central to the school of Lamennais. And it was, of course, to this heritage that the teachers of Uriage appealed. Yes, many of the particular obsessions of contemporary fascists may have been of secondary importance to the Catholic personalists we have been discussing, but the canonization of a submission of the individual to the will of the leaders of a non-rational community was common to both. What difference did it make if Uriage teachers employed Catholic-friendly words and phrases like “person” and the “Mystical Body of Christ” in their enterprise? How could one know what, exactly, these words and phrases signified when rigorous philosophical-theological examination of their meaning was ridiculed as decadent and unnecessary to men with “deep faith” working to lead men to the better world in the making? Alas, the consequences of this fascist mentality for Catholicism were, ironically, only fully to be seen when fascism itself was thought to have been unconditionally defeated, after 1945. And the postwar age that followed was to prove to be a time when the “business as usual demands” of “nature as is” were to triumph more completely than at any moment since the conversion of the Roman Empire; an era when the very Mystical Body of Christ herself, the “salt of the earth”, seemed to lose her savor—to the detriment both of true community and the dignity of the individual human person. Fascist Europe was doomed by the time that the United States and the Soviet Union were linked with Britain in the war against Germany. These first two countries were to prove to be the real victors in that conflict. Both found that that victory was useful as a postwar propaganda tool in demonizing the opponents of their guiding ideologies: Americanism---re-baptized in the postwar world under the more suitably international, freedom and diversity friendly name of “pluralism”---and Marxism-Leninism. All they needed to do in order to maintain this demonization was to keep the drama of the Second World War alive as a never-ending “current event”. Memory of the war was to prove to be a “Punic terror” that might always be evoked to stimulate a fear sufficient to maintain unity among any of their wavering troops. By repeatedly recalling the evils perpetrated by Hitler, the victorious ideologies were able to drive home the argument that everything non-Marxist or non-pluralist was, ipso facto, National Socialist; that anyone who opposed tyranny, bloodshed, and genocide had better fall in behind their banners and dread the consequences of breaking rank. Human awe in the face of victorious armed strength, combined with terror at the prospect of being labeled a fascist, badly crippled and even totally silenced opposition of any kind. The only weak point in this powerful ideological weaponry was the fact that it could be—and swiftly was—used by the two victors against one another as well as against their common enemies. Marxist-Leninists were the new fascists for the pluralists, and pluralists for the Marxist-Leninists—another example of the age-old divisions within a Grand Coalition of the Status Quo solidly unified only in its joint disdain for the corrective and purifying mission of the Word Incarnate. Although Marxism-Leninism, for a time, seemed to match American pluralism in its appeal as victor, it was ultimately the latter force that won the contest for exploiting a good story about the good war on its behalf. Using the innate and often unconscious power and prestige that came from conquest, the United States worked mightily to reshape the spiritual, intellectual, economic, and social systems of Western Europe in order to channel them to the service of its own pluralist vision. What could be more appealing to a world worn out by the incalculable human suffering accompanying ideological hatred and deadly political conflict than the pluralist offer of a practical, pragmatic “method” for dealing with the diversity and divisions of modern life; a method guaranteeing freedom for all beliefs and cultures to co-exist peacefully, subject only to the dictates of a “basic common sense” ensuring “public order”? What could be more suitable than the peaceful, “free marketplace of ideas and life styles” that it cherished? Persecution would end and every tear would be wiped away. If attempts to resist such a magnificent vista were not indicative of sympathy for the genocidal madness of the defeated fascists, then they could only represent a state of insanity pure and simple. Gradually, the influence of the pluralist message over every aspect of life, over every judgment regarding what one should think and how one should behave, became more and more inescapable. It was reinforced in daily imagery, from morning until night, from infancy until old age. So pervasive was it that the average youth in the Old World came to understand his counterpart in America even without a common spoken language and even as his own particular tradition became more and more incomprehensible to him. The pressure exerted upon individuals and institutions by the subtle and overt presuppositions and demands of the daily environment created by the American pluralist vision was, in short, overwhelming, rendering the idea of any protection against its ravages or any open resistance to it from any quarter whatsoever utterly utopian. This was a Defender of the Peace of whom the Nominalists and Regalists of the Late Middle Ages and the Reformation might truly be proud. Many European Catholics were as awed and acquiescent before the victors as everyone else on the Old Continent. The enormous difficulties of explaining a Christian position built upon theological, philosophical, and cultural arguments rejected by them frustrated a second group of Catholics into silence. A third Catholic element did speak out against whichever of the two victorious ideologies it deemed more dangerous, while remaining quiet regarding the errors of the other, and eventually even praising its own similar acceptance of the demands of “nature as is”. Yet another segment of the Catholic population, ashamed by the fact that some fellow believers had either been attracted by fascism or had seen in it a useful tool against a much more dangerous Marxist threat, enthusiastically embraced the message of the victors to compensate for sins which, uncontested, might be used as a pretext for casting aspersions upon the whole Church’s honor. And, finally, the atmosphere created by the “good story” about the “good war” allowed misled Catholics who were actively committed to Marxism or pluralism an audience and an impact that they otherwise might never have had. This was especially true if those activists had performed courageous deeds during the great conflict that might give them enormous prestige in the postwar anti-fascist world. Mention of this last group brings us back to the Catholic personalists. There is no denying that fascism, with its vibrancy, was intensely appealing to many personalists. But the dominant National Socialist strain of fascism was unavoidably and unacceptably tied to the Volksgemeischaft, and personalists, despite their other temptations, never succumbed to that of modern racism. After all, different races could be just as energetic in the support of their beliefs and traditions as the Nazis were of Aryan supremacy. In fact, it was precisely this truth that had led important missionaries into the personalist camp in the first place. In any case, a number of personalists courageously and openly opposed Nazi racism from the outset, both through membership in the Resistance Movement as well as in journals like the French Témoignage chrétien. They thereby gained understandable prestige as heroic exemplars for future generations. Even more significant in assuring personalist condemnation of all of fascism, non-racist as well as racist, was the simple fact that it had not been sufficiently vital to win the Second World War. Through defeat it lost the credibility it had once possessed as an engine of success. Victory in that conflict had been carried off by the Soviet Union and the United States. One might thus legitimately conclude that Marxist-Leninist and American-guided communities were those that possessed the greatest vigor and successful energy---and therefore the infallible stamp of approval of the Holy Spirit. Both conviction and prudence thus told personalists who had openly tried to collaborate with a non-racist fascism that the entire movement, at least as presently constituted, had to be jettisoned. Nowhere was this more felt than at Uriage.The deportation of French youth to forced labor camps, the increasing control by Germany of internal Vichy affairs, and the outright takeover of the Unoccupied Zone in the latter part of 1942 had already moved the leadership of the École closer to the growing Resistance Movement, long before allied victory was absolutely assured. This tendency matured by December of that year, when Uriage’s enemies at Vichy managed to have it expelled from the Château Bayard. But Uriage never did anything haphazardly. Building upon its sense of constituting a modern band of crusading knights, the exiled École leadership in 1943 created a Chivalric Order whose inner circle was bound by special vows of a character that Fr. Maydieu compared spiritually to those of matrimony. Members of the Order were to sally forth to show the various elements of the Resistance how to perfect their “mystiques” in the Uriage manner. Thus, high-level emissaries were dispatched to contact de Gaulle and “flying squadrons” into the countryside to guide the maquis so that their deficient mystiques could be “transcended spiritually” and “converge” in the construction of the better world of the personalist-Teilhardian Faith. The enthusiasm with which this labor was undertaken was genuine, but especially so with respect to the Marxist component of the Resistance Movement. Many, if not perhaps most personalists, felt a preference for the vital energy of the Marxist-Leninist element in the United Nations Alliance. 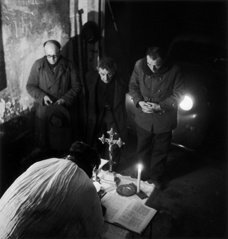 Despite the fact that its classic mish-mash of Enlightenment mechanism and willfulness violated the basic Catholic understanding of man’s simultaneously natural and supernatural, individual and social character, the Soviet communal emphasis was more immediately satisfying to the personalists’ pronounced social sense. One sees this not only among members of the Order but also in the writings and labors of priests and bishops trying to understand the “mystique” of the proletariat in German labor camps and ordinary French factories. Systematic training for the latter purpose was offered, from 1943 onwards, under the patronage of the supra-diocesan Mission de France. Uriage teachers were themselves deeply involved in these priestly activities. Fr. Dillard, for example, canonized the Soviet citizens he encountered in the labor camps and insisted that all industrial workers were born to carry out their tasks with the aid of specific virtues denied to other people. But an Uriage-like openness was noticeable in other, similar-minded circles. All such enthusiasts explained that there were “riches in modern disbelief, in atheist Marxism, for example, which are presently lacking to the fullness of the Christian conscience”. Enlightened spirits thus had “to share the faith in and the mystique of the Revolution and the Great Day (i.e., when all spiritually valid approaches would converge)”, as did one priest who asked to die “turned towards Russia, mother of the proletariat, as towards that mysterious homeland where the Man of the future is being forged”. One major problem with this enthusiasm was that the Catholic peoples who ultimately came under Soviet control did not show themselves as open to the charms of Marxist-Leninist communal energy as its personalist supporters had done. Yes, a movement of so-called Pax Priests, with an underlying theme of shared Catholic and Marxist pathways to international harmony and social justice, eventually did develop. However, it was tainted by its association with the governments of the Peoples Republics and the practical material benefits that could be gained for its adherents through such an alliance. In general, the experience of Soviet Marxism-Leninism, linked as it was with the reality of a party dictatorship backed by the military strength of the Red Army, did not become popular with the believing Catholic masses. This was especially true in those post-war years when the Papacy vigorously preached an anti-communist message. Moreover, insofar as the Russian authorities did feel the need to cooperate with religious forces, they usually found attempts to collaborate with national Orthodox Churches simpler and more fruitful than efforts to manipulate an international Roman Catholicism. Rome was as resistant to the allurements of the Marxist Defender of the Peace as she had been to that of medieval times. Another difficulty with Marxist-Leninist communal energy was its closure to the crucial prophetic mission of the personalists. One must remember that the sons of Uriage always retained their wartime sense of being a priestly nation, a people set apart, chosen to judge which aspects of burgeoning mystiques were and were not acceptable on the road to convergence. Marxism-Leninism, like fascism, was indeed acceptable in spirit. But it was acceptable as yet another “monstrous pre-figuration” of a happier future that had to be spiritually transcended in order to fulfill its true destiny. Uriage personalists were called upon to “witness” to the Marxist-Leninist “mystique” by raising it to a higher and fully appropriate level of consciousness---inside the Soviet Bloc as much as elsewhere. Unfortunately, the Stalinist cult of personality, the omnipresence of the Red Army, and the jealous apparatchiks of the postwar era stood in the way of their prophetic vocation. Worse still, with the fall in 1964 of a highly anti-religious Nikita Khruschev who at least possessed the virtue of rocking the Soviet boat to promote the meritorious within the communist ranks, “security for the apparatchiks” became the primary goal of the whole of the shaken party membership. Hence, the growth of that pervasive cynicism that affected not only the Soviet population at large but the system’s functionaries as well. For party functionaries understood that they survived as an elite only by demanding as little as possible in the way of labor, discipline, and the cultivation of “special virtues of the proletariat” from the common run of socialist mankind. None of these realities meant that Marxism was no longer still worth “transcending”; only that different paths to ensuring fulfillment of the sacred socialist mission were required. Divergent paths would have to be found outside of the sphere of influence wherein ran the writ of the apparatchiks and the Red Army. Still, many other vital cultural forces, some of which had already begun to attract personalist attention before 1939, were manifesting their potential for mobilizing energetic mass support in more pronounced ways during the postwar era. Some of these, like the feminist and sexual liberation movement, were vigorous in the western world. But, perhaps even more importantly, numerous other vital forces were to be found in the newly independent nations of Asia, Africa, and Oceania as well as in the semi-colonial protectorates of Latin America. Such energies reflected either flips on familiar European Enlightenment themes on the one hand or a resurgence of local, native beliefs and customs on the other. Of course, all these vibrant developments of western and indigenous cultures also desperately needed witness and prophetic transcending to ensure their perfection and ultimate convergence in the Holy Spirit. Latin America became particularly appealing to personalists and fellow travelers like Mounier, Chenu, Lebret, and even Maritain. Here, such men found social unrest in conjunction with an accelerated industrial development fueled by foreign capital, all of which seemed to portend the growth of a new and seemingly more “spirit-friendly” Marxism throughout the region. The energy unleashed by Fidel Castro (b. 1926) and Che Guevara (1928-1967) excited an especially explosive enthusiasm. Personalists thus began to hope that they would be able to use Latin America as a proving ground, diving into its “real world of the oppressed”, giving testimony to its budding message of impatience and rage with “structures of sinful dependence”, and rousing it to the kind of Marxist liberation that the Holy Spirit wanted but the apparatchiks of the Soviet Bloc stubbornly refused to permit. Yes, the mass of inert Latin American believers might not yet understand its own victimization---just as the bulk of Catholics had not grasped what the spiritually awakened Lamennais had to tell them. But that was always the job of the prophet: to shake a sleeping people out of its dogmatic slumbers to an appreciation of its true energy and the goal towards which it was unconsciously striving. Dictatorial and aging apparatchiks were certainly an obstacle to the emergence of a better world, but they were not the only danger standing in the path of vital energies and their future convergence. Traditional Catholicism itself, whichfrom Uriage days had “feared the insistence on bringing together men with different ‘mystiques’”, was increasingly seen to be at least as great a threat as an unresponsive Soviet Marxism, arousing in personalists “a ‘manly’ impatience with clericalism, dogma and the orthodox”. Catholic authoritarianism, manifested in its insistence upon adherence to frozen teachings and rituals, had to give way to changes dictated by diving into the living realities and vibrant energies of the day. Hence, the deeply committed Fr. Dillard ended by saying that his work in the vibrant forced labor factory was more important than his Mass, and, indeed, that the very machine on which he toiled itself actually had a soul of its own. Mounier is particularly instructive with respect to this intensifying dismissal of the whole of the Church’s traditional teaching and practice. His vision had always logically involved the possibility of shelving entire realms of Christian scripture, theology, and spirituality, should they clash with the “emerging convergence.” By the last years of the war, “there was little place for sin, redemption and resurrection in the debate; the central acts of the Christian drama were set aside”. Nietzsche’s critique of slavish Christianity now seemed to him to be unanswerable, and he “came to think that Roman Catholicism was an integral part of almost all he hated. Then, when he searched his soul, he discovered that the aspects of himself which he appreciated least were his ‘Catholic’ traits”. Doing what one willed was the unum necessarium. Not surprisingly, everything rational from the Greek tradition that had been used to support Christianity and dampen the vital will was execrated along with Catholicism as well. The Socratics, for him, were indeed Seeds of the Logos---and, as such, had to be driven into the wilderness with a fiery sword. Those obsessed with Catholic dogma, Catholic practice, and the philosophical hunt for the Logos all required diagnosis and serious psychiatric help. Hence, Mounier now flatly denounced old-fashioned Christianity and Christians. Christianity, he wrote, was “conservative, defensive, sulky, afraid of the future.” Whether it “collapses in a struggle or sinks slowly in a coma of self-complacency,” it was doomed. Christians were castigated, in Nietzschean style, as “these crooked beings who go forward in life only sidelong with downcast eyes, these ungainly souls, these weighers-up of virtues, these dominical victims, these pious cowards, these lymphatic heroes, these colourless virgins, these vessels of ennui, these bags of syllogisms, these shadows of shadows…”. Metaphysical speculation, Mounier declared, was a characteristic of “lifeless schizoid personalities.”…He referred to intelligence and spirituality as “bodily diseases” and attributed the indecisiveness of many Christians to their ignorance of “how to jump a ditch or strike a blow.” “Modern psychiatry,” Mounier wrote, had shed light on the morbid taste for the “spiritual,” for “higher things,” for the ideal and for effusions of the soul…Thus, once again, he dismissed many forms of religious devotion as the result of psychosis, self-deception or vanity. Prayer was often a sign of psychological illness and weakness that analysis could do much to heal. Vigorous exercise would help as well. This brings us back to the liturgical question, the liturgy obviously being one of the most important aspects of daily Christian life that would have to change with the emergence of a new and more vital personalist order. Uriage recognized as much, and was therefore permeated by the spirit of “pastoral concern” characterizing the more recent liturgical movement. This movement, in fact, was formative in shaping its own understanding of the importance and methodology of accommodation to active “mystiques” for the sake of the creation of the self-sacrificing individuals that true personhood required. Games can also be an excellent preparation for worship, which to the little ones appears to be very little different from a game. This should not scandalize us. The word game is not in the child’s vocabulary, and particularly in the realm of scouting, it is a synonym for diversion. A game is an action, passionate insofar as it is sincerely played. Well, official worship is eminently sincere. Children sense this. They find satisfaction in this atmosphere of truth. They savor this serious action, wherein all participate, body and soul, this collective and ordained action, similar in nature to those grand modern sports events herein modern youth finds its discipline and sometimes its mystique. But the little faithful heart senses well that worship is more noble than sports. Worship is the Big Game, the Sacred Game which is being played for the Chief of Chiefs….Among the troops the Mass is generally Dialogue Mass at which all actively participate. Certain among them make the offering. The cadets which Father Doncoeur leads each summer with knapsacks across France’s roads also have the Dialogue Mass. Gathered before the altar, they respond to the liturgical prayers, make the offering of the host which will be consecrated for them at the Offertory…. Concerned as it was with using all communal tools to build persons possessing the “leadership mystique”, Uriage turned the entire day into a “manly” liturgical experience. Bonfires were lit, backs slapped, virile poems and hymns composed, and special pageants mounted. Uriage claimed that all of these were, of course, inspired by “deep feeling,” constituting demands upon the developing persons of the community, rejection of which would have been a breach of Volksgemeinschaft equivalent to an individualist sin against the Holy Spirit. Interestingly enough, all of this new, “natural”, participatory, creative---and expensive---liturgical life was being elaborated while Frs. Maydieu, Doncoeur, Chenu, Congar and others were bringing into existence what would be the extremely influential “Center for Pastoral Liturgy”, designed to effect similar changes in ordinary ecclesiastical life. Worker-Marxist-Soviet mania from 1942 onwards increased the reformers demand for a liturgy based upon a pastoral response to particular mystiques to fever pitch. This often played upon Pius XII’s well-known willingness to take risks on the pastoral level if real success could be demonstrated to emerge from them. In any case, Henri Godin’s (1906-1944) famous work, France: Pays de Mission? (1943), outlining worker dechristianization, had created a sense of crisis in France that the pope could perhaps be counted upon to take seriously. This book argued that the loss of Church influence among the working class was so dire that all prudence had to be tossed aside. Lack of any precise plan for how to guide the pressing need to dive into the worker mystique was attributed to the spontaneous genius of those participating in the program and their unfailing faith in the Holy Spirit. My Latin, my liturgy, my mass, my prayer, my sacerdotal ornaments, all of that made me a being apart, a curious phenomenon, something like a Greek) pope or a Japanese bonze, of whom there remain still some specimen, provisionally, while waiting for the race to die out. Religion as they [the workers] knew it is a type of bigotry for pious women and chic people served by disguised characters who are servants of capitalism….If we succeed in ridding our religion of the unhealthy elements that encumber it, petty superstitions, the bourgeois “go to Mass” hypocrisy, etc. we will find easily with the Spirit of Christ the mystique which we need to reestablish our homeland. Yes, there was no doubt that the constraints of traditional Catholicism had to be relaxed, along with those of nefarious Soviet apparatchik influences, if the good spirits of Marxism and other energetic movements in Europe and the Third World were to come to fruition and converge. But how, practically speaking, could this work of liberation be accomplished? The only other viable political and social vision was that of American pluralism, and this outlook did not at first appear to many personalists to be all that promising. “The Americans,” Beuve-Mery, who went from Uriage to the management of the highly influential postwar French newspaper, Le Monde, complained, “could prevent us from carrying out the obligatory revolution, and their materialism does not even have the tragic grandeur of the materialism of the totalitarians”. Still, a number of personalist fellow travelers, Jacques Maritain prominent among them, were much more hopeful, arguing that American pluralism was an immensely powerful revolutionary force suitable for breaking down many petrified traditions—if only it were witnessed to properly. Through the Marshall Plan and its support for supra-national, continental economic reconstruction, pluralism’s powerful vision had already begun to break down traditional authorities and work for that European union that so many personalists—along with the Nazi New Order itself—had also longed to achieve. Maritain argued that American pluralism might even lend itself to a convergence with the most vital spiritual elements of a Marxism whose true transcendent mission was being botched by the Soviets. Besides, one simply could not deny that the impact of the pluralist message of a practical openness to a world of diversity was as strong on European Catholics as it was on everyone else on the war-weary Continent. They, too, were tired of a divisiveness that had seemingly produced nothing but hatred and conflict. The words of the conqueror were beautiful words indeed, and Maritain could point to the fact that American Catholics were among their most fervent propagandists. Pluralism could become the Defender of the Peace and the Defender of Freedom for everything and everyone, including fresh, exciting, energetic developments noticeable in the Old as well as the New and Third Worlds. It could, therefore, powerfully aid the work of personalists in witnessing to their many vital mystiques and assuring their convergence in fulfillment of the message of the Holy Spirit. Perhaps. But the Holy Spirit in question was one whose teaching would have been recognizable to Lamennais, and, in one way or another, to supporters of the whole “tradition” of Gnosticism, Nominalism, the Reformation, and the Enlightenment, from whose decadent path to “purification” the Catholic revival movement of the nineteenth century had passionately sought to remove the Church in her Head and Members. Hellman, The Knight Monks, of Vichy: Uriage, 1940-1945 (McGill-Queens, 1997)p. 56. Hellman, Mounier, pp. 85, 90. Hellman, Knight Monks, pp. 4-52, 68-92, 139-162. Hellmann, Knight Monks, p. 65. Poulat, Les prêtres-ouvrières (Cerf, 1999), p. 408. Hellman, The Knight Monks, p. 88. J. Duquesne, quoted in D. Bonneterre, Le mouvment liturgique (Fideliter), p. 39. Cholvy and Hilaire, Jeunesses chrétiennes au xxe siècle (Ouvrières, 1991),III, 274. Poulat, Les prêtres-ouvrières, pp. 329, 333. Hellman, The Knight Monks, p. 213.